AURORA, IL--(Marketwired - Oct 15, 2015) - BERNINA of America, the premier manufacturer of sewing, embroidery and quilting machines, is pleased to introduce its new BERNINA 530 Special Edition - Swiss Red (Swiss Red) and BERNINA 215 Simply Red (B 215 Simply Red). 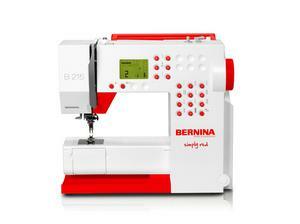 Both machines are available now at authorized BERNINA Dealers nationwide. The Swiss Red is available in limited supply and features a BERNINA Red faceplate that celebrates BERNINA's Swiss origins, heritage and family tradition. It also comes with an exclusive BERNINA suitcase. The B 215 Simply Red is BERNINA's new entry-level machine and ideal for price-conscious beginners who value quality and sewing convenience. "With our Swiss Red, BERNINA is continuing its tradition of offering a collector's model that represents BERNINA's quality, Swiss engineering and innovation. It's a mid-priced BERNINA that can be used for simple sewing tasks and more advanced creative projects," said Paul Ashworth, President of BERNINA of America. "The BERNINA 215 Simply Red offers a new opportunity for sewists to appreciate our Swiss precision and outstanding Dealer support at an entry-level price. It's versatile and easy to work with, and owners can add more features as their skills increase to provide years of sewing enjoyment." 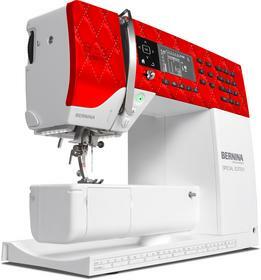 The Swiss Red features a sewing speed of up to 900 stitches per minute and 11 needle positions to provide the precise sewing quality that BERNINA owners expect. It also comes with five BERNINA presser feet, a slide-on table, and an exclusive BERNINA suitcase, which offers full shock-absorbing protection, rugged wheels, and an extendable handle. Additionally, machine owners have the option of adding a BERNINA Stitch Regulator (BSR), which provides consistent free-motion stitching, even at high sewing speeds. The BSR is available alone or included in the new Quilter Accessory Kit, which also features the BERNINA Walking foot #50, BERNINA Patchwork foot #37, and a magnifying lens set. The MSRP for the Quilter Accessory Kit is $1,299. Other features of the Swiss Red include a powerful DC motor that gives full sewing power at all speeds to provide consistent stitching on multiple layers and heavy fabrics. Its control panel also offers quick access to all stitch patterns and settings, including reverse and mirror functions, and a manual or automatic buttonhole. An electronic foot control is included as well, allowing sewists to enjoy consistent speed control plus a heel/tap feature to raise and lower the needle. The Swiss Red is practical and flexible, making it the ideal sewing machine for ambitious sewers. To learn more, visit www.bernina.com/5series.